My son John had been studying 'Godot' in French this year so when I heard that the esteemed Druid Theatre Company were coming back to it again in a whole new production… well, we had to be there. We nearly weren’t though. The tickets went like hot cakes and it was only the addition of two further matinees that enabled me to get hold of some seats. We drove down to Galway last Wednesday, making a day of it. Godot has long had a place in my heart. I even read the part of Gogo in The Linenhall for Beckett's 100 Anniversary. We weren't all that bad either. I really don’t get why people complain about it. As a play, I find it completely engaging. Funny when it likes and almost heart-breaking when it needs to be. It gives the actors a chance to exercise their chops too. All four of the adult parts have to work hard to earn their crust in this one, there are no coasters. I thought this was the most excellent afternoon of theatre. The cast were the very soul of integrity, playing their parts with unreserved physical and verbal commitment. As far as I could tell, the text was respectfully adhered to, except for a bit of business with Pozzo’s pipe which probably came down to modern fire regulations. Marty Rea and Aaron Monaghan brought Didi and Gogo vividly to life. Didi tall and angular – a tattered elegance in spite of his evident waterworks difficulties. Visually, a sort of a Beckett ‘Cat-In-The Hat’. Gogo, a person much more of the ground, worn down, tired, fretful and forgetful. Rory Nolan is excellent, playing Pozzo as a sort of semi deranged Uncle Monty. He brings colossal physicality to the performance space, making the front row squirm with delicious discomfort as if, at any moment, he would might sit down and join them. Garrett Lombard is a broad and a dangerous Lucky, his face a contortion of pain and exertion. His famous ‘think’ speech seemed almost deliberately undermined by the overplaying of the reactions of the rest of the cast. Then again, all of that is in the stage direction. The production dots in cartoon elements, somewhat reminiscent of a cartoon like quality evident in 'The Lonesome West', years before. The fourth wall is infrequently broken, the characters gaze off into the wings in that familiar exaggerated pose of seeking, one leg extended to the rear and, most notably, whenever they attempt to escape the area via the rear, they painfully encounter an invisible wall and become flattened there, like Wile E Coyote on the windscreen of a tunnel-emerging truck. The Druid performance space is intimate. The very proximity of the performance makes it like watching the ultimate HD experience. The very weave of the clothes that the characters wear is there to be inspected. When Pozzo eats a chicken leg, you can smell the chicken itself and hear him slaver over it. It almost made me wish that the sense of smell itself played a little more part in the production, although Vladimir and Gogo and Lucky too would all obviously be quite ripe. For me, the genius move of this production came at the end of each of the two acts, when the moon rose into view. I loved the way the moon changed both Didi and Gogo. It was as if they almost became drunk on its presence. It emphasised a relief that night and finally landed and the question of whether Godot would come or not was once again put safely to bed. I loved the dreamlike essence of these latter scenes. A masterful detail. 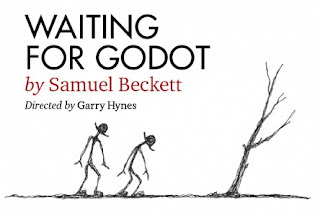 Many people seem to get their knickers in a twist over Godot. I think most of those people haven’t seen it or at least haven’t seen a world class production like this. On Wednesday afternoon, sitting as we were in the half round, it was plain to see that the audience were fully engaged, amused, horrified, saddened and, yes, perhaps occasionally bewildered. Godot isn’t ‘hard’, it’s easy. It is what it is, right there in front of you. See it. Soak it in. Enjoy it. After the play, John and I went around to corner to ‘Fat Freddy’s’ to have a couple of their much loved pizzas. We were only there a few minutes when the cast came in. Being a talker, I told them how great I thought they were and asked them to sign my programme. They were great, chatty and personable, and I knew enough not to trouble them for very long. And then, suddenly, unlike Godot, there he was. Now here’s an odd thing. Before I went back to bed this morning I heard Carrie talking in the living room. The bird was still covered up so it had to be me she was talking to. I went back in and asked her what she was saying. “Are you Didi or Gogo?” she asked. No preamble, nothing, straight in. “Didi,” I said without batting an eye. “Which would make me Gogo then.” I had no problem with that, said as much and went to bed. There are Didis and Gogos dotted all around the flat. There’re the two she had made for me along with the boots she made herself; there are a couple of polar bears, one standing, one sitting, that can only be them; I even have two Garfields that have more than a passing resemblance to the two tramps. I certainly don’t need to tell you how much this play means to me and, like you, I’m baffled by those who don’t enjoy it even if they don’t fully get it. The first time I saw it I didn’t get it—far from it. It was an Open University performance at the crack of dawn. The inimitable Max Wall played Vladimir against Leo McKern’s Estragon: an inspired pairing. (You can see Act II here. Scroll forward to 34:49.) I was entranced. The next morning I made my wife and my best friend’s girlfriend who was staying with us at the time get up and watch the repeat—no video recorders back then—and I simply couldn’t understand why they weren’t even half as captivated as I was. Beckett’s an odd one. He’s both popular—I can’t imagine a day goes by somewhere on this planet that one of his plays isn’t being performed somewhere—and yet he also manages to put off as many. I remember when I was trying to get people to review Milligan and Murphy how many played the Beckett card: Oh, I find him hard. Christ knows what they’d think of the new book then. You called that novel a love letter to Beckett and I recall correcting you at the time because if you want to read a love letter to Beckett then wait until I post you your copy of The More Things Change. The clue’s in the first line: I call my protagonist Valentine for Christ’s sake! I’ve only ever seen the play live once and we were in the front row; you don’t get more intimate than that. When we filed in the two actors were onstage, frozen and they stayed like that until we were all seated; the lights faded and suddenly the two came to life. Wonderful!